When Jack Stein, that’s Rick’s son, heard his old man was planning to open a casual take away on Fistral Beach he jumped at the chance to offer surfers something a little different to fish and chips. Looking to cook up your own taste of Indo? Take a look at the recipie below, an anlgo take on the classic Asian dish. The secret of a good nasi goreng is rice that has been cooked well so that the grains are separate, and which has been left to cool but not refrigerated. Leftover rice that has been stored in the fridge overnight does not taste as good. Like so many rice or noodle street dishes from South-east Asia, nasi goreng is a bit of a ‘put whatever you like into it’ sort of dish. However, it should always include a good curry paste, some thinly sliced omelette and plenty of crisp fried onion flakes. I always put prawns in my nasi goreng and I love some broken-up well-flavoured fish like mackerel in it too. First make the nasi goreng paste: put the paste ingredients into a food processor and blend until smooth. Cook the rice in boiling, salted water for 15 minutes, until just tender. Drain, rinse well and then spread it out on a tray and leave until cold. Preheat the grill to high. Season the mackerel on both sides with salt and pepper. Lay them on a lightly oiled baking tray or the rack of a grill pan and grill for 4 minutes on each side. Leave them to cool and then flake the flesh into large pieces, discarding the bones. Next, beat the eggs with salt and pepper and then heat a little oil in a frying pan and make three omelettes. The object is to get them as thin as possible. Cook each one till the egg has lightly set on top, then flip over and cook a few seconds on the other side. Roll the omelettes up and leave them to cool. Then thinly slice the omelettes into strips. Pour 1 cm ( ½ inch) of sunflower oil into a frying pan. Add the shallots and fry over a medium heat until crisp and golden brown. Lift them out with a slotted spoon and leave to drain on kitchen paper. Spoon 2 tablespoons of the oil from frying the shallots into a large wok and get it smoking hot. Add 2 tablespoons of the nasi goreng paste and stir-fry for 2 minutes. Add the cooked rice and stir-fry over a high heat for another 2 minutes, until it has heated through. Add the prawns, the strips of omelette, the fried shallots and the flaked mackerel and stir-fry for another minute. Add the soy sauce, cucumber and most of the spring onions, toss together well and then spoon on to a large, warmed plate. Sprinkle with the remaining spring onions and serve straight away. 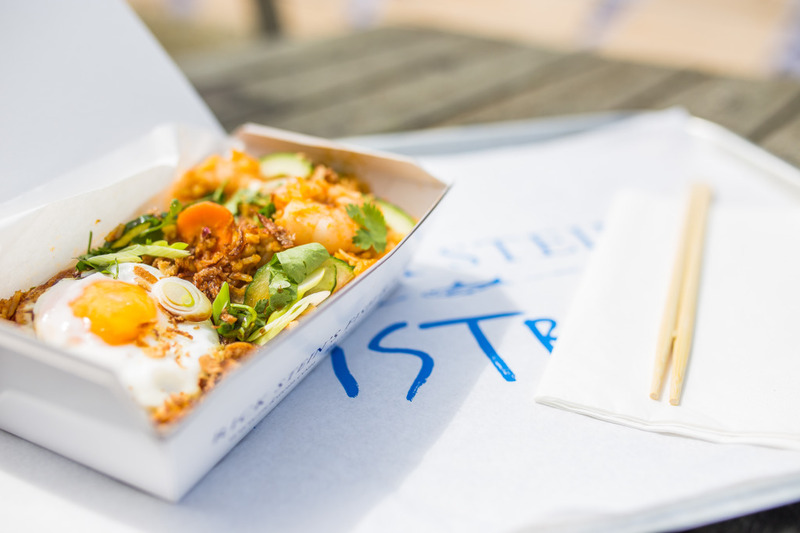 Find more about Rick Stein and see what’s happening at Stein’s Fistral.